I willingly admit that I am the oldest of my families, yes, families for I have two families and all of us are bound by blood. Today I show you my mother’s family, the one I grew up with. This family consists of four Lees and six Robinsons. Although our mother has died in January, 2001, we 10 children still get together as often as we can. Our sizes change (scales show that weights are up more than down), hair grows grayer (unless covered by hair coloring) and thinner, but the shared hugs are still strong. Noise and laughter levels could break any sound meter, the same arguments and stories are repeated, and tables are always spread with a superabundance of food, just like Mom taught us. 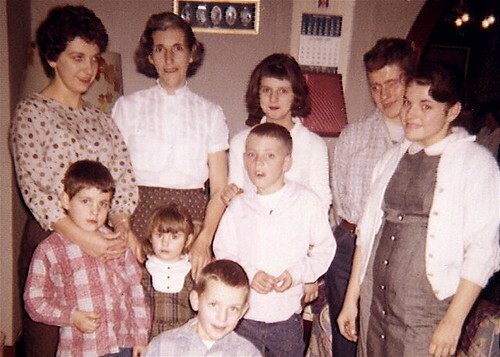 Taken late in 1960, this photo shows me, Mom, and my six Robinson siblings, as well as step-brother, Walter Robinson. In Front: Fred Ray. Middle Row: George Thomas (Butch), Nancy Lynne, Michael Edward, and Carolyn Sue. Back Row: Joy Dean, Mom (Lucille), Barbara Jean, and stepbrother Walter. December, 2007, all ten of us, Lees and Robinsons spend an evening together. In Front: George Thomas (Butch). 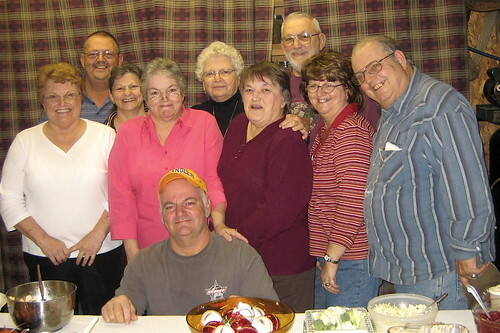 Middle Row: Joyce Ann, Carolyn Sue, Mary, Barbara Jean, and Michael Edward. Back Row: Fred Ray, Nancy Lynne, Joy Dean, and Joe.